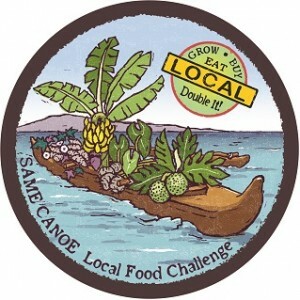 The Same Canoe Local Food Challenge is hosting a fun receipt contest. We invite submissions of your favorite recipes that use traditional Hawaiian canoe crop plants in delicious, healthy and creative ways. We will be selecting the Winners, one each quarter, during 2017 and 2018, with prizes including an overnight at a green-built BnB on an organic farm growing canoe plants, gift certificates for restaurants serving canoe plants, and canoe plants or foods for your home or garden. We’ll also feature the winning recipes at community food showcases at local farmers’ markets and events. To submit your entry, please copy your recipe into the message box below. You are also welcome to add a photograph of the food being made, or as served. I taught this recipe in a free class that Moms against Monsanto offered to the public in Molokai. I large Ulu cut into bit size pieces and partially steamed. Large handful of cilantro leaves or 1 small bunch Chinese parsley chopped up. 1 tsp. Or to taste Sea salt ground fine. Put 5 tablespoons oil, like avocado or macadamia oil or any good oil into a frying pan and heat pan on low. Add I tsp. of turmeric, powder, green jalapeño chilli chopped fine and 5 cloves of chopped garlic and a large handful of cilantro (Chinese parsley) to the oil. Stir fry on low for two minutes stirring constantly now add back the Ulu pieces that have been partially cooked and stir fry until the Ulu is evenly and well coated with the oil, spice and herb mixture. Sprinkle fine sea salt over the dish. Now cover and cook for a few more minutes until the Ulu is cooked through.and evenly coated with the oil and spice and herb mixture. Test with a fork to make sure Ulu is cooked through. Serve hot. At what point do you peel it? Can you peel and steam and then cut into cubes? Thanks for this – we’ll be trying it. Feel free to add a photo next time you make it. Sounds great!!! Can’t wait to try it! Mahalo for sharing! Turmeric Coconut Drink: 2 c whole turmeric washed, One 3 inch piece of ginger root, washed, 10 black peppercorns, 1 tablespoon cinnamon, one can whole fat coconut milk or meat of one coconut cubed, 2-4 c filtered water. Place all in vita mix and blend on high till creamy and smooth. Place in large enough pot and bring to a simmer. Watch the contents as bubbling and splattering may occur if heat is too high. Once the mixture has been brought to a boil let simmer for a minute or two then pour into 1 gallon pitcher. Add 1 cup honey stir till it is melted. Add filtered water to reach desired thickness. Add more honey to taste. Enjoy warm or chilled. Any peeling involved with turmeric or ginger? Thanks for the photo. We’d like to add cloves and cardomon, would you do that in a strainer type tea diffuser? or? Generously grease and flour, or spray, a loaf bread pan(that can hold 2 1/2 pounds of batter. One pound of extremely over ripe bananas, peeled. In large mixing bowl with paddle attachment on low speed, mix bananas until they are nearly mashed and free of large pieces. Add coconut oil, extract,spices, salt and baking soda and sugar. Continue to mix on low speed until ingredients are well blended and smooth, scraping the side of bowl as needed. Place the baking pan on middle rack in heated oven. Depending on depth of pan, begin baking for 30 minutes, but usually will take longer. Very deep, heavy pans can take up to an hour. The top may attempt to get very dark. Check the highest point regularly with a clean toothpick until it comes out totally clean and you have a firm, but not hard, loaf. Remove from oven and allow to cool until you can handle pan without baking mitt. Turn loaf out of pan on side and cool completely. It makes incredible PBJ sandwiches. You can substitute sweet potatoes or even sweet squash in place of the bananas. Dates and figs, too! Extroidinary with creamed cheese and fresh strawberries! You can add nuts or chocolate nibs or chips. This batter also makes a nice muffin or cake layer. Including pineapple and coconut and nuts, a wonderful humming bird cake can be accomplished. The trick to all of these is being attentive to baking, and adjusting the time in the oven. And yes, no egg in case you were wondering. In a medium bowl, combine graham cracker crumbs and melted butter. Firmly press into a crust in the bottom of 9×13 glass or porcelain dish, let it chill in the freezer for about 10 minutes to firm up. In a medium bowl, mix together the cream cheese and the sugar until creamy. Don’t be tempted to add milk, it will take a few minutes, but the mixture will blend up perfectly! Spread the cream cheese mixture over the cooled graham cracker crust. Add a layer of sliced bananas over the cream cheese mixture. Spread crushed pineapple evenly over the bananas. Mix the pudding mix with the cold milk. About 2 minutes. Then fold in the whipped topping. Evenly spread the this mixture over the pineapple-banana layer using a rubber spatula. Chill for at least 4 hours before cutting to allow the layers to set. I make this for breakfast at least a few times a month! I like to have it after I drink some Olena or Mamaki tea in the morning. It smells like cinnamon rolls baking while it cooks, and turns out to be like pudding or porridge. Can make it as thick as you like, smooth or with lumps. Either way, so creamy and ono. I have never measured out the exact amounts of anything, just use plenty. So the amounts given are approximate. also optional if you like it sweeter: local honey or sugar to taste. Add the ulu and water together in a pot. Bring the whole thing to a boil, then lower to a simmer. Cook until Ulu is soft and breaks up easily with a fork. Make sure the water level stays just high enough to cover the Ulu. When ulu is nice and soft, it is time to turn it into porridge! You can smash with a fork or potato masher, or blend with a blender, food processor, or immersion blender for a very smooth and creamy consistency. After this, add as much coconut milk as you like (1 cup is usually enough for a whole ulu), and stir it up. Stir in cinnamon, vanilla, salt, optional protein powder, sweetener. Maybe add a little more water to keep it cooking happily. Just so it doesn’t burn or get too thick. Let it cook very low for just a while longer until it’s your perfect favorite consistency. Sometimes it’s nice to slice banana on top! Lots of ways to change it to your taste. Enjoy!